About the time I think I’m done with this project for a while, I receive a package from Joan Ettinger, a consequence of online correspondence with her son, Glenn Ehrstine, a German professor at the University of Iowa. Initially, when he mentioned that his mother had a photograph from a family reunion, I found myself shrugging it off, doubting that it would add much to our understanding. Still, she included a copy in the materials she sent me – in the process, changing my opinion completely. A picture can, indeed, add much to the story. The view has 3½ rows of people in their Sunday best arrayed in front of a pristine white barn. It’s a modified Switzer-style structure, with a ramp leading to central doors; in this case, the ramp is only a few feet high, while each of the sliding doors is perhaps a dozen feet wide. The letters, H.C. EHRSTINE . 1913, stand prominently above them. The top of the roof is not visible, although much of the foreground is – a mixture of gravel and grass, much like the farm I remember my Binkley relations owning. 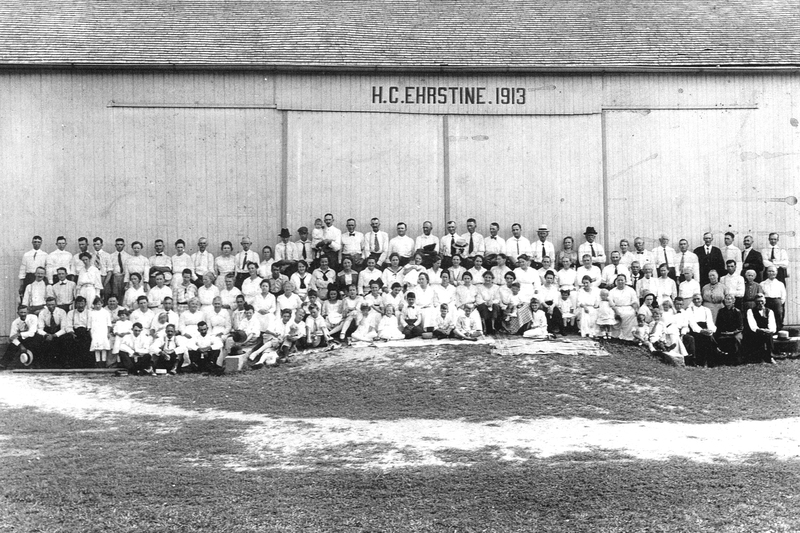 Hand-lettered at the bottom of the photograph is “Third Annual Ehrstine Reunion – Aug 20-16,” the “s” being reversed. In the photograph (my copy measures 11½ by 9 inches; the original may have been much larger), the people occupy a band taking up just under a quarter of the space, just above the midline of the shot. I count 117 people, 53 of them men and boys, although it would appear there are many more females shown. Most of them wear white shirts or blouses or dresses, and many of the men have neckties. This being a summer afternoon, the suitcoats or vests are removed from all but three. To think, these are all descendants and their spouses of a father-and-son who arrived in Montgomery County a century earlier. The family had proliferated, indeed. H.C. Ehrstine would have likely been my great-grandfather, Henry Clayton Ehrstine; 1913 would have been the date of the barn, and the farm would have been the “home place” in Clay Township he and his wife bought on April 7, 1907. Perhaps, since this was the third annual reunion, much of the event took place in or around the barn. The two correspond in age. The idea of a family reunion would itself have been something of a “newfangled” notion, and we may wonder just what everyone did that particular afternoon or how long they stayed. I take a magnifying glass to the image (something you can do by clicking on the image; a second click will enlarge a portion of the picture even more). The evidence of change becomes more apparent, even when the figures and faces remain minuscule. On the men, the neckties and a few bow ties suggest that the majority of the family was adopting to newer ways in the land, an idea reinforced by the women – mostly in the middle of the assembly – who wear sailor suits and other fashionable styles. In terms of religious affiliation, these would have leaned toward the Church of the Brethren or the United Brethren, or maybe even no membership at all. Still, mostly on the right-hand side of the picture, a few individuals maintain the old ways – one woman with children has a bonnet; a few men have beards but no mustaches and wear suspenders but no ties. These are the ones who are likely in the Old Order German Baptist Brethren or Dunker congregations. (Unlike the Amish, the Brethren never rejected photography; still, I wonder why this wing of the family chose to stand at the periphery.) I look closely, guessing at which women may be wearing small white prayer caps. There is no hint at great upheaval around the corner. The World War that would soon envelop the nation’s attention was still distant, and there was no need to deny the family’s German legacy – much less its pacifist witness. This barn was built for draft horses, not tractors, and an economic order that would soon come under fire. We don’t see how many of these people arrived by car and how many by horse-drawn carriage. Nor do we know how many lived in town or the city, or how many worked farms. The fact that this photograph comes to me by way of the Illinois branch suggests that someone came east by train, continuing a family connection. That this is a professionally taken photograph, probably on glass plates, indicates this was a very solemn occasion. There is something formal in the gathering of blood relations. The magnifying glass also picks up on small drops that have run across sections of the picture and stained it. Have any other copies survived, or were they over time discarded or lost? Henry would have been 57 at the time; his wife, 54. A prosperous farmer, basking amid his kin. I’m not quite sure I’ve located them in the picture, although he and his wife may be standing next to their son and his wife of the left side of the back row. I think I’ve found my grandmother and her sister, youths seated on the ramp, making me wonder if my great-great-grandmother, Caroline (Hess) Ehrstine is right behind them. For now, of course, her appearance remains a mystery. We might wonder, too, if the future World Series pitcher Jesse Haines, just turned 23, or his parents are among them; the reunion would eventually become a joint Haines-Ehrstine event, and he and his wife would be buried in Bethel Cemetery, along with Jacob and Caroline Ehrstine. Perhaps he is one of the young men off to the left. In the meantime, in their own way, they become a cloud of witnesses, confronting me and my own era. Just who is looking at whom, after all, here?